(by Bruce Golding, New York Post) – At least 44 people were killed and more than 100 wounded in Palm Sunday blasts at two Coptic Christian churches in Egypt for which ISIS claimed responsibility. The bombings targeted worshippers celebrating the start of Holy Week, the most sacred period in the Christian calendar, and came less than three weeks before a scheduled visit to Egypt by Roman Catholic Pope Francis. Coptic Pope Tawadros II narrowly avoided being caught in one attack while leading Mass at St. Mark’s Cathedral in the coastal city of Alexandria, where a deadly explosion erupted at security checkpoint outside. 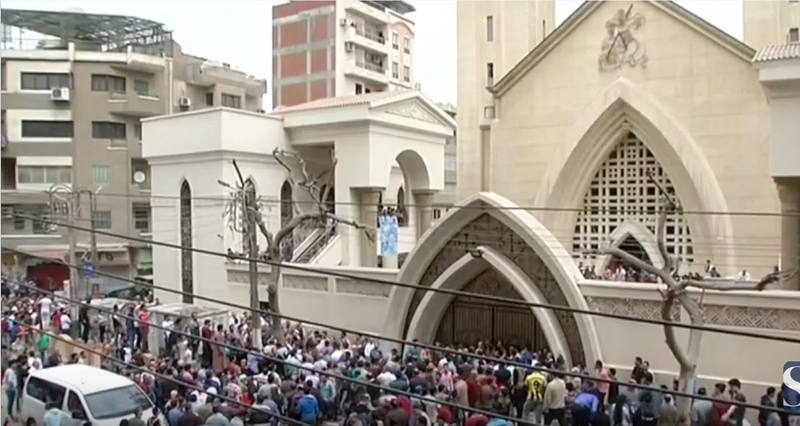 Surveillance video broadcast on Egyptian TV showed a suspect with a blue sweater draped over his shoulders being turned away from the main gate and sent toward a metal detector outside the church, which members of the country’s beleaguered Christian minority attend. The man then passed by a female officer chatting with another woman before they were all engulfed in a fireball that killed at least 17 people, including four police officers, and wounded at least 40. The other blast, which occurred earlier, tore through the inside of St. George’s Church in Tanta, which sits east of the Nile River between Alexandria and the country’s capital, Cairo. Video from a local news report shows deacons chanting and ringing a bell before a test pattern fills the screen, followed by audio of explosion and screams. In grisly images of the aftermath, victims lie amid rubble and papers while blood stains the floor, shattered pews and marble columns of the historic church. Another survivor told Reuters she saw “body parts scattered” after the blast, which killed at least 27 people and wounded at least 78. Sunday’s attack followed the defusing of a bomb found outside the church on March 29. ISIS released a statement claiming that two terrorists wearing suicide vests were responsible for the carnage. “Crusaders and their apostate allies should know that the bill between us and them is very big and they will pay it with rivers of blood from their children, God willing,” the statement warned. In December, a massive church bombing killed 30 people in Cairo, and several killings in the Sinai have caused hundreds to flee to safer areas. Earlier Sunday, al-Sisi ordered the military to guard “vital and important infrastructure,” and state TV reported that the provincial head of security had been fired and replaced. …Worshippers at St. George Coptic Orthodox Church in Brooklyn bemoaned the lack of protection for Egypt’s 9 million Christians, who make up just 10 percent of the country’s population. Mina Kolta, 31, said a friend’s cousin was among the victims in Alexandria. Reprinted here for educational purposes only, from the New York Post. May not be reproduced on other websites without permission from NYPost .com. 3. What are Copts? What percent of Egypt’s population are Copts? 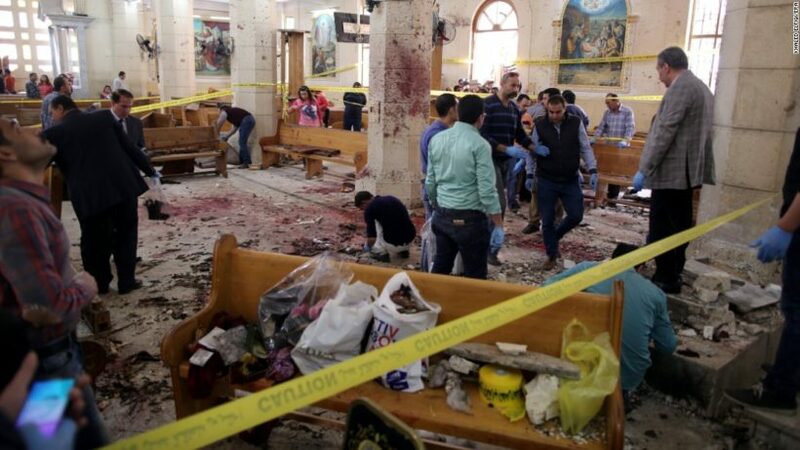 4. a) How many Christians were killed / wounded by Islamic terrorists in Egypt on Palm Sunday? b) How many were killed in a previous December church bombing in Cairo? c) Why have hundreds of Copts left Sinai recently? 5. a) How did Egyptian President al Sisi react to the latest terrorist attacks on Egyptian Christians? Be specific. b) What do you think of his response? Why do you think the ISIS terrorists attacked Egyptian Christians during their church service on Palm Sunday, the beginning of Holy Week? Coptic Christians [known as ‘Copts’] are Egyptians whose ancestors embraced Christianity in the first century. The Coptic Christian population in Egypt is the largest Christian community in the Middle East. 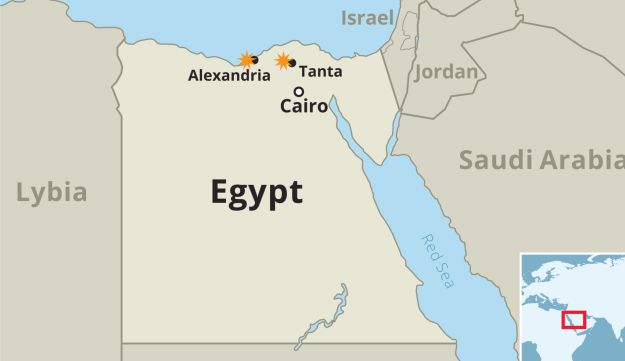 About 95% of Egypt’s Christians are members of the Coptic Orthodox Church of Alexandria, which was established in the 1st century A.D. by Saint Mark. The Church is headed by the Pope of the Coptic Orthodox Church of Alexandria. Copts (Coptic – literally: Egyptian Christian) are native Egyptian Christians, usually Orthodox, who currently make up around 10% of the population of Egypt — the largest religious minority of that country. While Copts have cited instances of persecution throughout their history, Human Rights Watch has noted “growing religious intolerance” and sectarian violence against Coptic Christians in recent years. In just one province (Minya), 77 cases of sectarian attacks on Copts between 2011 and 2016 have been documented. Tradition holds that the Church of Alexandria, Egypt was founded by Saint Mark the Evangelist in approximately 42 AD. Within 50 years of St. Mark’s arrival in Alexandria, a fragment of New Testament writings appeared in Oxyrhynchus (Bahnasa), which suggests that Christianity already began to spread south of Alexandria at an early date. The Muslim conquest of Egypt took place in AD 639. forced conversions to Islam over the centuries changed Egypt from a mainly Christian to a mainly Muslim country by the end of the 14th century. In Egypt today the government does not officially recognize conversions from Islam to Christianity; also certain interfaith marriages are not allowed either, this prevents marriages between converts to Christianity and those born in Christian communities, and also results in the children of Christian converts being classified as Muslims and given a Muslim education. The government also requires permits for repairing churches or building new ones, which are often withheld. Foreign missionaries are allowed in the country only if they restrict their activities to social improvements and refrain from proselytizing (actively telling people about Jesus). Coptic women and girls are sometimes abducted, forced to convert to Islam and marry Muslim men. Returning to Christianity is illegal.